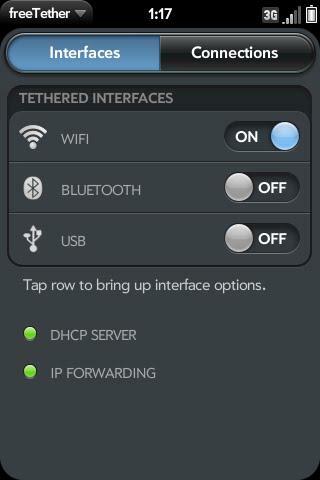 Huzzah and hooray - tethering is now easy (well, easier) for webOS homebrew aficionados to install and use. Thanks to WebOS Internals (with a special shout out to PuffTheMagic), a lovely little app called FreeTether is available to anybody who's daring enough to enable the test app feeds in Preware and download. It will tether via WiFi most easily, but can also handle both USB and Bluetooth tethering if you prefer to kick it old school. Obligatory caveats: if the terms Preware, testing feed, and bugs scare you, well, we recommend you wait a bit longer to try it. More importanly, remember that while this app will enable tethering for any webOS phone, what effect that has on your data costs is between you and your carrier - buyer homebrewer beware. In our testing thus far it's a little slower than we'd hoped, but this thing is still in beta stages and given how much work we imagine went into this app, we're not going to knock it. Take a look at the buglist if you're interested and be sure check out the source link for more info. Finally, if this sort of thing helps you or just makes you smile, WebOS Internals is always happy to take donations.